Video Inspection Scope - ODM VIS300 i VIS400 - FIBRAIN - information centre - news, awards, events. Stay tuned! With great pleasure we would like to inform that video-microscope to inspect fiber connections are now available in our product portfolio. These microscopes are produced by ODM- renowned American company, whose Fibrain is the exclusive partner in Poland. Together with the continuous growth of fiber optic technologies and higher awareness of operators, installers and technicians video-inspection microscopes are becoming increasingly popular. With the use of a microscope we can easily check and verify the quality of the connector, whether it is scratched or dirty. It is estimated that 70 % of all problems in optical networks are caused by poor quality of connectors. a. VIS300 -SND with USB to connect to PC. Includes 4 tips: 2.5mm female universal, 1.25mm female universal, SC PC and LC PC male. b. VIS300-KIT - with 3.5 ''LCD monitor , with the same set of tips. c. VIS300-KIT-USB - as above, but additionally a monitor has a USB port with a possiblity to run the software, which inspects connectors. 2. 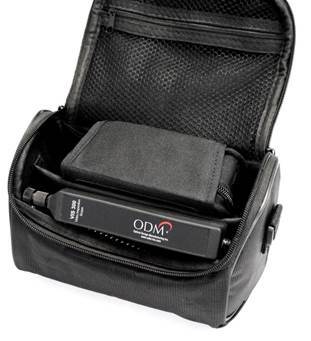 ODM VIS400 - digital proble of high-resolution with USB. Standard set of tips ( 2.5mm female universal, 1.25mm female universal, SC PC and LC PC male), fully automatic software to perform the analysis, in accordance with IEC 61300-3-35. To get further information please contact with our Sales Department.